We kindly ask you to send your abstract if you did not send it yet. We shall send the volume to print on the 25th of May. The conference will take place at the Euler International Mathematical Insitiute (EIMI), which is a part of the St.Petersburg Department of V.A.Steklov Mathematical Institute (usually abbreviated as PDMI or POMI). Registration and the talks will take place at the Euler Institute. The EIMI address: Pesochnaya naberezhnaja, 10, ("naberezhnaja" means "embankment"). 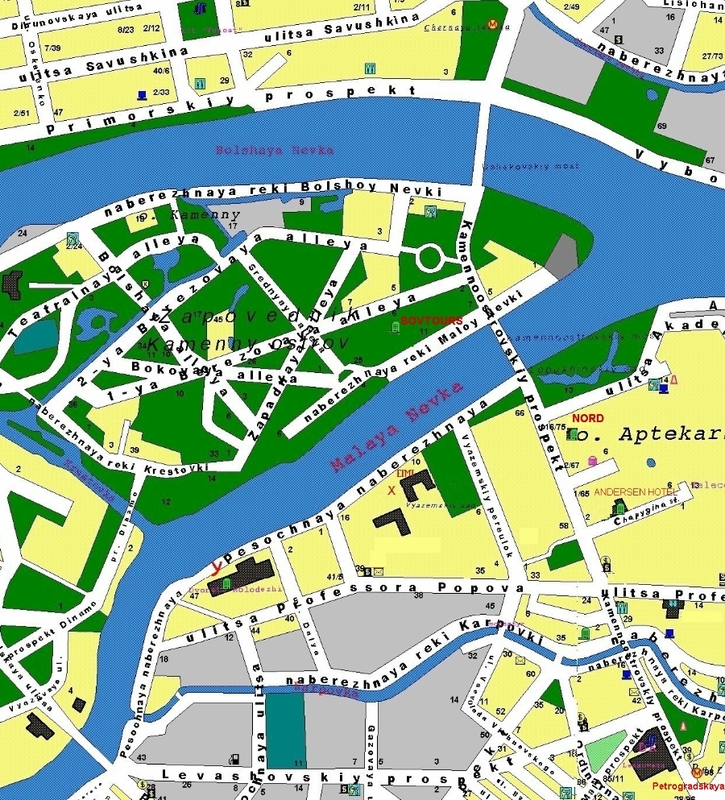 The Euler Institute on the bank of Malaya Nevka river, at equal distances (15-20 min. walk) from the metro stations "Petrogradskaya" and "Chernaya Rechka". To reach EIMI from the metro station "Petrogradskaya" you can either walk or take bus No. 1 or No. 46, trolley-bus No. 34 (two stops), or minibus No. 46, 76, 136, 252, 298 (you should ask the driver to stop before Kamennoostrovskii bridge). Here is the algorithm which takes you to the Euler Institute/ Nord hotel from the airport. Take bus no. 13 or 31 or a minibus at Pulkovo International terminal (Pulkovo II) or bus no. 39 at the domestic airport (Pulkovo I). It will bring you to the metro station "Moskovskaya". Then it takes about 30 minutes to reach the stations "Petrogradskaya" (you don't have to change metro lines). Then from the metro station you can either walk or take bus no. 1 or 46 or trolley-bus no.34 that goes to Pesochnaya Naberezhnaya and to the hotel Nord (two stops), or minibuses no.46, 76, 127, 136, 252, 298 (you should ask to stop before the Kamennoostrovskii bridge). Those who come by train can easily use metro since every railway station has a nearby metro station. The registration desk will open at the Euler Institute on May 31 from 16:00 till 20:00 and on June 1 at 9:00. The registration fee is 240 USD, and 30 USD for visa invitation if it was not paid in advance. The euros or roubles equivalent may be paid also. The conference will start at 10:00. Those of you who arrive later can register during the coffee-breaks. There are several computers in the Euler Institute, you can check your email account from there and surf the Internet. WiFi is also available. There are many internet cafes in the city centre. Euros and US dollars are exchanged in all exchange places. Other currencies may cause difficulties (bad rate or no bank to deal with your exotic currency). At the moment, the average rate is 34.80 RBL for 1 euro and 25.90 RBL for 1 USD. Keep in mind that some banks and exchange places use the following cheating trick: outside the exchange office they advertize a "good" exchange rate but "term and conditions apply": usually you have to exchange more than 499 dollars (euros) to have this good exchange rate. Be cafeful and do not exchange the currency NEAR the exchange offices when the private persons offer it. Personal and Traveller's checks, as well as credit cards, are usually accepted at all major banks in the city. VISA and MASTER cards are accepted in some shops and restaurants. In order to use the metro you must buy tokens. One token costs 14 roubles. In buses, trams and trolley-buses you must pay to a ticket-collector. One ticket costs 14 roubles. There are also commercial buses (marked by letters T or K) There, you also pay to a ticket-collector. In commercial minibuses you pay to the driver. The price is usually indicated on the front window and at the entrance (about 15-17 roubles). Please be very careful with your luggage, bags, purses, credit cards, etc., especially on the transport and in shops! By the way, eating places in Russia are usually called cafes $K A \Phi E$. So, a "cafe" is a small-size restaurant or a diner, not a coffee-house. The word "restaurant" usually implies that this is a luxuary or expensive eating place, so no wonder that many diners try to avoid calling themselves restaurants. There are very good cafes and not-so-good cafes, the same applies to restaurants. There are public phones in the city. Some accept coins, some accept phone cards (it depends on the phone). You can buy phone cards at metro stations. The wheather is variable. The average June temperature is 15C. So, usually it is about 20C during the day. It may rain. Like in many other tourist centres in the world, there are pickpockets and thiefs who target foreign tourists. Don't carry large sums of money with you. Always have the phone number of your bank to be able to quickly block your credit card transactions in case they are stolen.